The Young Entrepreneur Business Fair is an annual, grassroots event that fosters innovation and entrepreneurship in local youth through workshops and a comprehensive showcase event. Follow our page to see key events & details leading up to the big day! The fair is for youth between the ages of 6 & 16, and there are lots of ways to be involved as a local business owner! 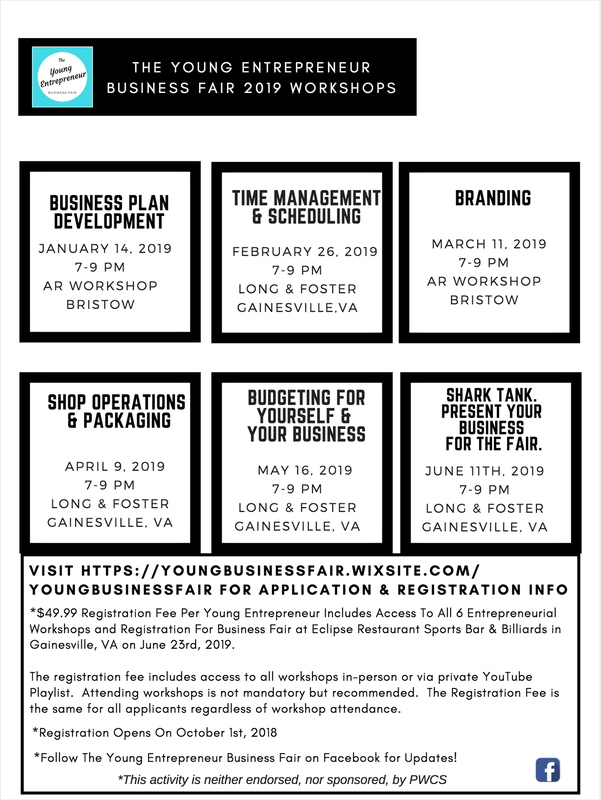 The Young Entrepreneur Business Fair gives young entrepreneurs between the ages of 6 and 16 the opportunity to display their business idea at a comprehensive community event on June 23, 2019 from Noon-4 PM at Eclipse Restaurant in Gainesville, VA! Registered young entrepreneurs will receive access to monthly 2-hour entrepreneurial workshops at AR Workshop Bristow, VA and Long & Foster Gainesville from January to June 2019 to aid preparation for the business fair, and to provide guidance and mentorship in the process of developing a young entrepreneur's business idea from concept to launch. *Monthly Workshop Dates and Details can be found at The Young Entrepreneur Business Fair Facebook Page. Once registered, you will receive routine updates about upcoming events, as well as resources, templates, and tools to help your young entrepreneurs get started! Please be sure to answer all questions at ticket registration regarding your child's business concept. The photography and video consent waiver is required for participation in The Young Entrepreneur Business Fair.